Miserable weather did not manage to interfere the best street style looks of Paris Fall/Winter Fashion Week. And we are very thankful for that. Most fashion icons who came to Paris from places that don‘t usually go below zero degrees celsius, had to find a way to keep themselves warm, yet look their best in between the shows. That is why all kinds of layering and oversized coats were the base of majority of the looks. We looked through everything and chose our favorite bits and trends to share with you. Many ladies chose to rock a one color suit this season, which is our new favorite trend. Doesn‘t matter if it is oversized or tight fit, the combination of a blazer with matching trousers is the perfect muscular look. 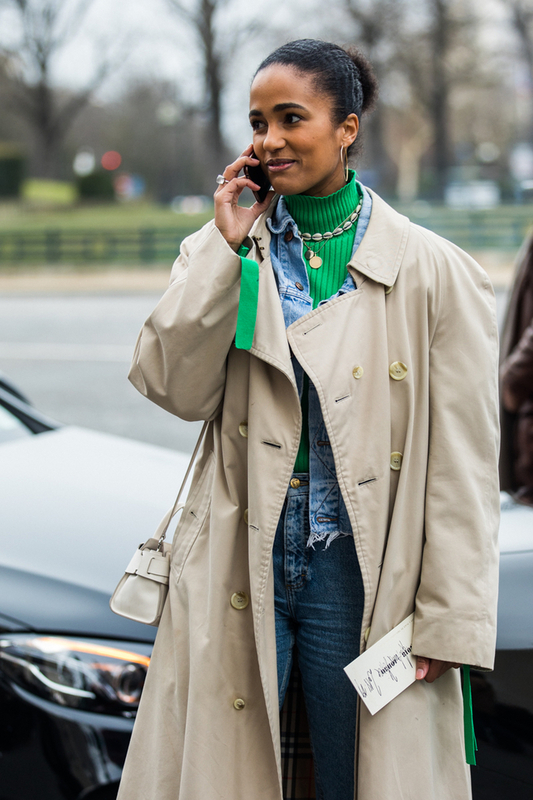 Paired mostly with white shoes and simple accessory choices, the ladies were bringing us all of the possible girl boss vibes. Under all of the layers, it was very common to see pops of green details. From dresses to turtlenecks and shoes, this bold color accent was fashionistas favorite. Vibrant green is already making their way to the store shelves, so this is a definite must have this season. And if we had to choose the ultimate trend of this season‘s street style looks – see through details would be it. Bags, hats, shoes and even long coats were made in to clear pieces this season. And yes, you could actually see what everyone was bringing in their bags, which is always exciting. Going along with the more masculine flow, statement trousers were a hit also. And let me tell you, the more unusual, the better. Baggy, highwaisted pairs with ankle details, alongside flowy, ill fitting, rare materials were our favorite. The one color that completely took the shine in Paris was lavender. With vibrant violet being the color of the year, it seems like all tones of violet are going to pop this season. No matter if it‘s just a couple of details or a full head-to-toe look, lavender was there.